Blog Home | Backyard Chickens | Chicken DIY | Chicken Crafting | How I beautified my coop–cheap! 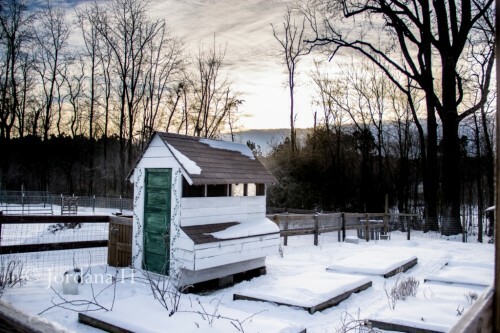 This winter I finally decided it was time–and I beautified my coop–for next to nothing! Now it’s a bright, cheery spot in the brown winter landscape. Don’t get me wrong; I love winter! I love all seasons, but the magic in a newly fallen snow-covered landscape is especially appealing. Sadly, I live in the warmer south now and we get very little snow most years. Instead of that sparkling beauty as the sun comes up we have brown… and more brown, with a spot of green from a pine tree or ground ivy. 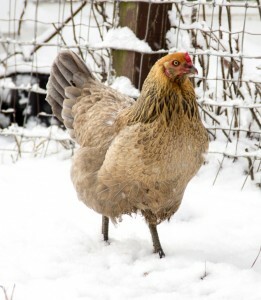 A rare winter snow is lovely near my newly decorated coop. I still remember the crisp air of Michigan when I was a child, the way the sun rose and you could see your breath on the frosty air. 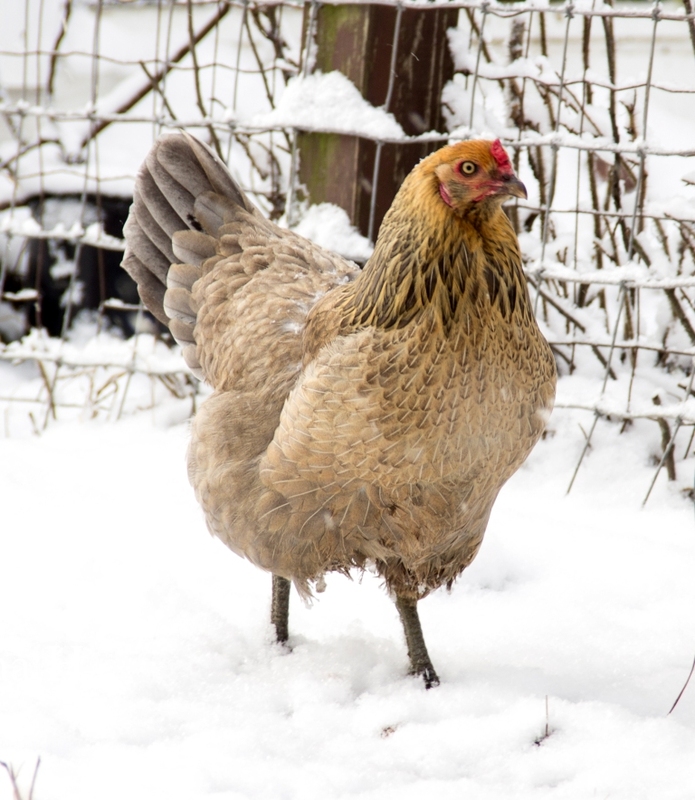 I remember shoveling paths for our chickens when the snow was higher than I was tall, and how they would all follow me around like little ducklings all in a row, hoping I would drop just one more grain or scrap of carrot peeling. But now I live in the land of bleak winters, where if we are lucky we get an ice storm that makes the world look like diamonds, or a small snow storm that you have to run out and enjoy before it all melts away. To be fair, outdoor winter chores are a lot easier in the south, but they can leave you longing for spring or something pretty in the dreary months. This has led to an urge to create beauty wherever I can, beauty that will be there when the weather is gray and the earth looks dead. Of course, the beauty of my chickens stand out in this dead landscape. 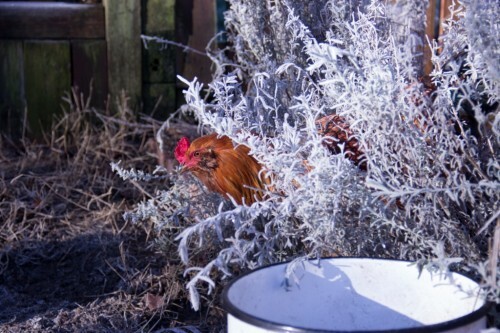 I especially love how my cochin rooster is striking, with his shiny feathers and bright red comb. I love the variety of color in my flock of hens as I watch them scratch, looking for a worm that might have come out while the sun was still high and the soil warm in the middle of the day. Still, the colorful chickens were not enough for me. I needed something more… and I finally figured out what it was: I needed whimsy in the landscape itself. So I beautified my coop! Have you ever looked through magazines, or books on chicken care and homesteading, to seen those glossy photos of pretty garden coops with little up-cycled benches, wind chimes made of cutlery, or painted pots? Then you walk out and see your make-shift coop in all its scavenged glory and the bare earth where your hens have scratched away every living thing? The photos draw you in, make you long to go spend just a moment walking through them. They make you dream about what it would be like to actually have a coop and yard like that. Did you desperately want to beautify your coop somehow? It’s such a deflated, depressing feeling, and you shrug and say “oh well, time to go water and feed” and off you go to your “regular”coop, just like yesterday. Well, that was me. I didn’t have one of the fancy coops with window boxes or cute little doors and runs like the coops My Pet Chicken offers. Our family did not have the resources to buy much to decorate our own yard, much less the chicken yard. However, one day I just said to myself, “Enough! I have to have something pretty, something magical, so that when I am out with my chickens and doing chores it feels like I am in a special place”. My first coop with a painted mural. That very day I decided that—though I did not have money—I did have creativity. 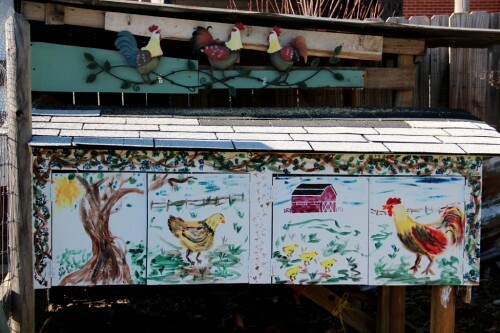 I had to combine that with my vision and ingenuity to come up with inexpensive ways to beautify my coop. It is amazing what people throw away (or in my case, what broken things we save or bring home… ahem). And you know what? I found out that whimsy isn’t hard. I beautified my coop and created a magical place by incorporating sound (chimes or cutlery or pots that sing in the wind), broken things set up in a way that makes you feel nostalgic (old rakes, hoes, and benches are great) and adding that odd element that no one expects (like my wire bird cage). My chicken yard beautification project is no-where near complete, but when I walk out now in the dreary southern winter, I can hear my chimes and imagine the garden next spring as I plan my next additions to the sound of my rooster crowing and my hens’ gently humming about the latest bug or a new-laid egg. 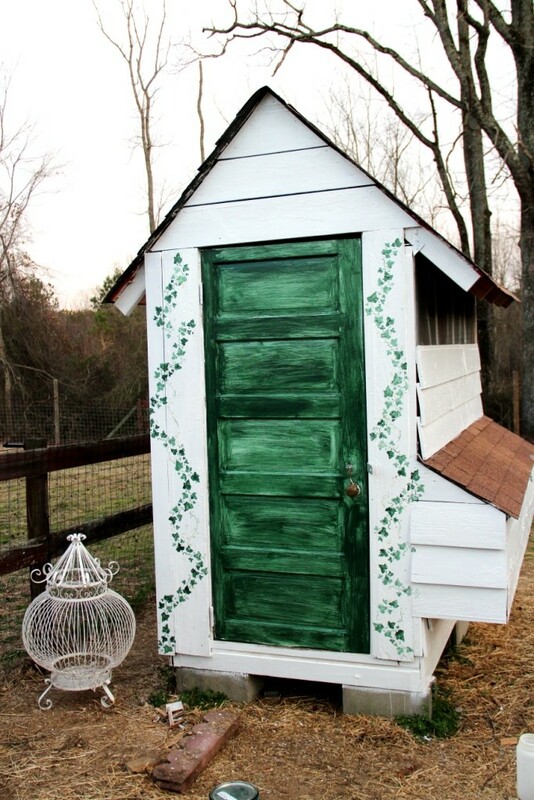 I would love to see how you have made your coop or chicken garden whimsical, or even hear your dreams, what you would like to do in the future. We all need a little pretty and a little magic in our lives! put a TV in the coop to decrease the boordome factor, and it just got worse. Found CNN was the problem. 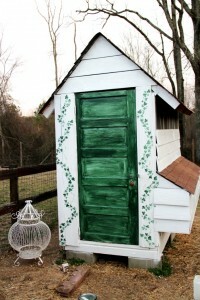 Great ideas, we have a garden coop that is pretty utilitarian and could really use some charm! Niel, we also had bad results with Fox News. Turns out one shouldn’t have Fox in the hen house. What a special coop you have here, I absolutely love it! And I am sure the chickens do to!